Wednesdays in the PACU (post surgical recovery room, basically) mean one thing at my hospital: kid day. Little kids, big kids. Kids. Today we had 7 “kids” under the age of 18. Yeah, talk about fun. The day started off with 2 1-year-olds. One who had his adenoids out, and one who had ear tubes placed – both are minor surgeries. (I say minor lightly, because to the kid, and the parents, it’s a huge deal, but as opposed to a move invasive procedure, it’s a quick easy surgery and quick easy recovery, usually). Then we had 2 5-year-olds, same deal. And then a few EGDs. Anyways, I am usually voted on as the “nurturer” of the PACU, which means I get the responsibility to pick the kids up, coddle them, and snuggle them, while they scream until someone runs to bring their parents back. Good times. After a long day, I got home and took my shoes off, put my feet up.. And my phone rings. My poor dad was stranded because his alternator was dying, and needed me to come give him a jump. Boy, does it feel good to be needed by my dad for once instead of the other way around! So I popped Rosie (my dog) into my truck and went to rescue my dad. My brother comes to town this weekend, and I am more than looking forward to seeing him! We’re not super close, but it’s always nice to have him around. ANNNNND, he’s bringing me a present.. Like, a set of golf clubs present! CAN’T WAIT! 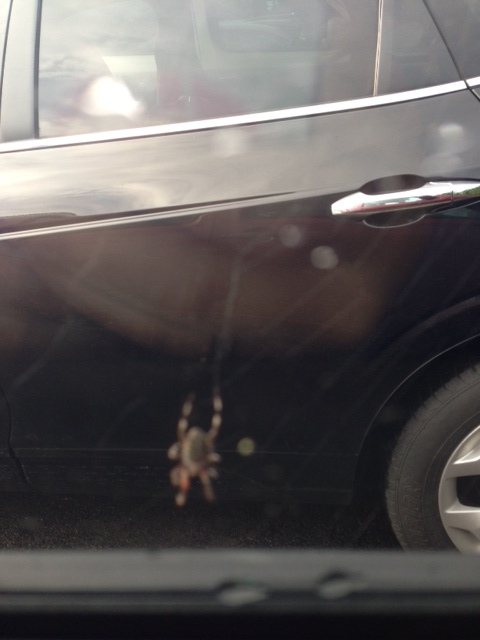 Oh, and finally, check out the massive spider that was living inside my side-view mirror for a month. (S)He finally exposed herself, and I won’t share what I did to it! What’s your favorite “fast” food place to eat, and what do you order?